Safe Solutions is also your tile and grout expert. Using state-of-the-art equipment, we are able to give your tile and grout a thorough, deep cleaning. From tile floors in kitchens, bathrooms and living areas, to showers and walls, even countertops; we do it all! With use over time, tile and grout tend to lose their squeaky-clean appearance. Regular cleanings complete with scrub brushes and harsh chemicals just cannot achieve that professional appearance. Our powerful truck mounted system does what regular cleanings could never accomplish, removing residue from hard to reach areas. Give our system a try. You’ll be glad you did. Safe Solution's Wood Floor Care removes dirt and oily residue from your wood floors. We are also able to apply a urethane top coat that lasts for years without the high cost and mess of sanding and refinishing a wood floor. Cleaning hardwood floors can be a challenging task one that extends beyond the capabilities of your mop or broom. They simply move the dirt around, and fall short when it comes to extracting unseen, ground-in dirt. Avoid doing things the hard way. 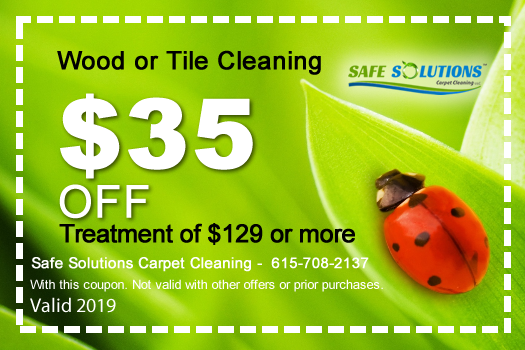 Safe Solutions wood cleaning process will extract the dirt from deep within the cracks and crevices of your hardwood floor and can also in most cases restore the original beauty you once had.